, corresponding to C terminal amino acids 575-588 of Human PPP2R1A. Our Abpromise guarantee covers the use of ab31316 in the following tested applications. WB Use a concentration of 0.03 - 0.1 µg/ml. Predicted molecular weight: 65 kDa. The PR65 subunit of protein phosphatase 2A serves as a scaffolding molecule to coordinate the assembly of the catalytic subunit and a variable regulatory B subunit. Required for proper chromosome segregation and for centromeric localization of SGOL1 in mitosis. Cytoplasm. Chromosome > centromere. Centromeric localization requires the presence of BUB1. ab31316 (3.8µg/ml) shows staining of PPP2R1A in paraffin embedded Human Thyroid Gland following steamed antigen retrieval with citrate buffer pH 6 and AP-staining. 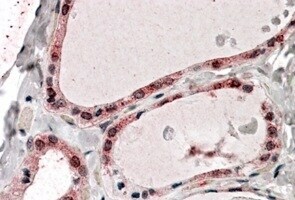 This shows textured cytoplasm and membranous staining in the epithelial cells. ab31316 has not yet been referenced specifically in any publications. Publishing research using ab31316? Please let us know so that we can cite the reference in this datasheet. There are currently no Customer reviews or Questions for ab31316.